A cute set of salt and pepper shakers from Giftcraft. 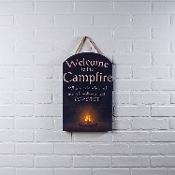 Welcome To Our Firepit Novelty Sign Gather around the firepit, and adorn your home with this decorative novelty sign from Melrose International. Reads: Welcome to our firepit, where friends an marshmallows get toasted" Size: 11.5" x 23.5"